With its restrained, tasteful quality and practicality, if you want an instrument to play night after night you won’t do better. Literally nothing, although that’s one hefty pricetag. Go into any West End music theatre or UK television recording studio and there’s a good chance that the bass player will be using an Overwater. These players demand an instrument that sounds great while being versatile, reliable and ultra-quiet - all defining characteristics of a modern Overwater bass. Chris May’s career as a luthier started way back in the late Seventies. This reviewer had one of his early basses, and it’s fascinating to see how his work has developed. A little of the DNA of those early instruments is still evident in the basses he builds today, both in their design and their playability. The Hybrid Custom 5 uses figured English walnut for its body and headstock facings and is finished to a flawless satin sheen. 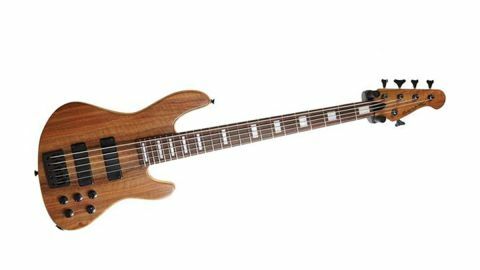 Walnut is heavy, but most of the body is light, resonant swamp ash; as a result this bass weighs in at just over nine pounds - about the same as a standard four-string Jazz. The Hybrid’s name is explained by its neck design. The neck pocket extends all the way to the front pickup - almost a third of the body length. As well as providing a strong joint, this should - in theory at least - impart some of the harmonic richness and sustain associated with a through-neck design. The neck is made from three pieces of maple, the centre piece having a faint flame. It looks handsome and feels perfectly proportioned. The unadorned fingerboard is Indian laurel, which looks like rosewood but is a little denser, more environmentally-friendly, and free from import/export restrictions. The bass’s pickups are technically single coils, but they have a ‘ghost’ coil without magnets or pole pieces fitted below the functioning coil to eliminate noise and hum. They’re fitted as a matched pair, with the output from the bridge pickup set marginally higher than that from the front to compensate for the slight decrease in string dynamics near the bridge. The hardware is top quality, with custom-spec, Gotoh-style lightweight tuners and a solid, milled bridge. The large, black controls are a joy to twiddle. The bottom row has a master volume with a pull/bright function and a pickup blend with a centre detente. Above these are the controls for bass, middle and treble. All these are made from high-density plastic, so there’s no need for them to be grounded to cut noise. The three-band preamp circuitry was designed by Chris May and Dennis Cornell (of Cornell Amps fame) and has been tweaked over the years by renowned electronics wizard John East. As well as being surprisingly light, the Hybrid Custom 5 is beautifully balanced. Its 35” scale length means the tension on the B string is just right, and the long, slender neck and generous fingerboard are fast and comfortable. With the EQ set flat, the bass sounds bright without being harsh and is harmonically rich in the bass frequencies. There’s a slightly pronounced mid and a long, bell-like sustain. The powerful EQ offers sounds ranging from plummy Fender Jazz tones to an aggressive, almost synth-like rock tone, but my favourite sounds come from leaving the controls near their centre positions. Set like this, you really can hear the rich tonal qualities of the timbers. From here, pulling the volume control gets you a subtle boost to the higher frequencies that makes individual notes pop out - perfect for slap lines. Wal basses have had a similar control since the Eighties; we don’t understand why more basses don’t follow suit. It’s not hard to see why session and theatre players love Overwater basses. The design, workmanship and materials combine to make the Hybrid a great musical instrument, a versatile working tool, and an exquisite piece of craftsmanship. By the time you read this, this particular bass will be in New York, where some top Broadway session or pit player will be discovering just why so many UK bassists use Overwaters.